I used extra virgin olive oil in my oil cleansing routine, and I broke out like a 13-year-old would if they washed their face with bacon pizza. That is not an uncommon complaint, although it’s not the rule. Occasionally, extra virgin olive oil receives raving results on the oil cleansing page. This problem is more than vexing, because we’ve all heard – for years – about how healthy extra virgin olive oil is, for your insides and your outsides. But, finally, after a year of pondering this quandary, science has come through and delivered what I think may be at least part of the answer to the extreme ranges of success that extra virgin olive oil exhibits. 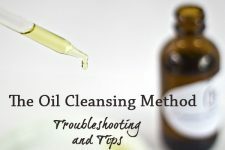 Lest you think the information I’m about to share here only applies to you if you use the oil cleansing method, it does not. What I’m about to present to you should absolutely, 100% change the way you shop for olive oil … even if you’re just eating it. Researchers at the University of California – Davis recently did us all a huge, huge favor. They tested a plethora of imported and non-imported extra virgin olive oils to see whether or not they were actually, truly extra virgin. It turns out, most of them were not. Not even close. In fact, most of the brands found to be fraudulently labeled as extra-virgin olive oil are brands you might even have in your own kitchen. Think Bertolli. Think Colavita. Whole Foods. Star. Fillipo Berio. If you’d have asked me three months ago if I’d ever renew my Costco membership, I’d have said “never, ever, ever, ever again, please momma no!” I just did though. Shelled out the $55 to join a club where I’m shoved and trampled just trying to pick out a parmesan cheese. Why? Because Kirkland brand olive oil was one of the VERY few (and the only locally available EVOO) to pass the extra virgin purity test. Thank you, Costco. You’re now a hero in my eyes. 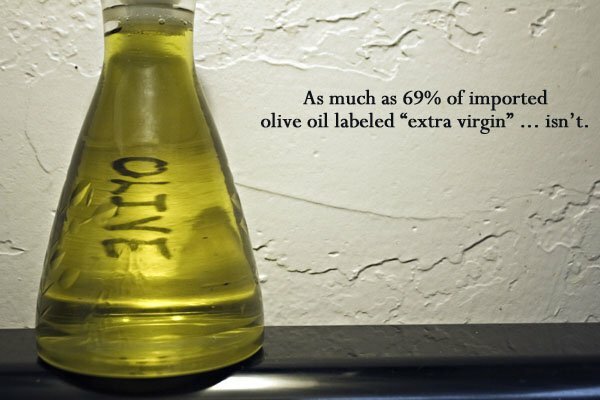 This study has shown that up to 69% of imported extra virgin olive oils are actually very fraudulently labeled. Yikes. It wasn’t just the UC-Davis study that was alarming; there’s a new book out called Extra Virginity: The Sublime and Scandalous World of Olive Oil, in which the author, Tom Mueller, reveals that – because of lax regulations and standards in the olive oil industry – olive oil can easily be tainted, cut with other oils, deodorized, and then sold as extra virgin … without anyone being the wiser. Kinda makes you wonder what you’ve been eating all this time, doesn’t it? How Can You Tell if Your Olive Oil Is Extra Virgin or Not? I cannot attest to the efficiency of this home test (although I’m trying it right now and will be able to attest to it soon enough), but apparently extra virgin olive oil and virgin olive oil will react differently in very cold temperatures. In a small bowl, pour a bit of your “extra virgin” olive oil. Cover it. Pop it in the refrigerator for 24-48 hours. When you take it out, if it has crystallized, it is extra virgin. If it has hardened into a solid lump, it is NOT extra virgin. How Can You Find Olive Oil You Trust? Imagine standing in a store. Before you are two people holding cartons of strawberries for sale – one, a local farmer you’ve spoken to on occasion, the other a business man who just flew in from the strawberry farm in Argentina. Which strawberries would you likely choose to buy? The local ones, right? It’s almost a no-brainer. Unfortunately, olive oil just isn’t that easy. A vast majority of olive oil available to the bulk of us regular consumers is imported. We have no way of knowing the people behind the business. Unless you live in California, where olive oil pours forth like manna from the heavens and coats all its residents with healthy, glistening goodness. The first thing I’d do is stop buying any of the brands that made the fraudulently labeled list. No more Colavita. No more Bertolli. No more Whole Foods (of all people … for shame). Secondly, if you have access to the brands that did pass (Kirkland, Corto, California Olive Ranch, McEvoy Ranch Organic), stick with them for now. Next, see if you can’t find a smaller seller and ask them questions. For instance Mountain Rose Herbs (who I fully trust in terms of their integrity) sells extra virgin olive oil. And we have a small store in town called the Olive Tap that sells it, as well. I plan on having a lengthy conversation with their owner soon. I bet he can’t wait! What IS in this extra virgin olive oil? Finally, see that EVOO up there? It’s Carapelli, and I bought it on ridiculous sale several months ago – before knowing any of this information. There’s a little stamp on the back that says it’s made from different olive oils from four countries – Italy, Spain, Greece and Tunisia. My guess is that if you’re taking olive oils pressed in four different countries, with four totally different suppliers, the chances of contamination, subpar quality, or unscrupulous “cutting in” of other oils is really high. I don’t know this to be fact, but given everything I’ve just learned, I’d say it’s highly likely. Especially when you consider that Carapelli was one of the brands on the “fraudulently labeled” list. So look for olive oils that are produced in one country only. Like this one (which is my personal fave). And, again, if you can talk to the business that sells it, you can find out all the information you need to make a conscious choice. Will This Change the Way You Buy EVOO? You remember Rachel Ray, right? The queen of EVOO? The maker of the trend, the master of the brand? You know she sells her own brand of EVOO? Guess what? It’s on the fraudulently labeled list. 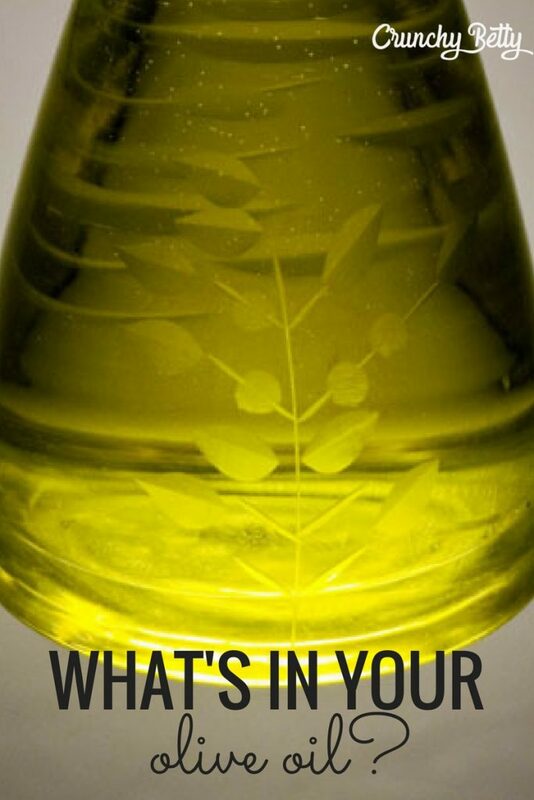 How are you feeling about your olive oils right about now? Will you change the way you buy it? And – for those of you who’ve had problems with the OCM using EVOO – care to give it a shot with the “real thing?” One more time? For CRUNCHY science? Just so we can see if it makes a difference, and if we can rule out – forever and for all – whether or not it’s an appropriate oil to use on your face. Wow! Thanks for the important info. I just sent off an email to Whole Foods, asking what they’re going to do about this. Thanks for the heads up! Hmm..I was pretty astonished to read this. So I looked at that article and list, and it’s from July 2010. I did, however, find an article on NPR that was just from December: http://www.npr.org/2011/12/12/143154180/losing-virginity-olive-oils-scandalous-industry. So I wonder if anyone has reached out to these companies, or if any of them have reacted to these stories and studies? I’d be VERY interested to hear what WF has to say about this. I emailed Whole Foods this morning to ask them about this, and here’s the response they just sent me – at least they’re getting back to me quickly! Whole Foods Market Extra Virgin Olive Oil Apulian, DOP, 750mLAll of our olive oils are certified by the North American Olive Oil Association, except the 100% Californian in which our supplier is a member of the California Olive Oil Council. All of the olive oils are products of Italy, except the 100% Californian and the 100% Turkish and these oils are products of the USA and Turkey, respectively.Our Extra Virgin Olive Oil from Val Di Mazara in the Sicily Region, our Extra Virgin Olive Oil from Terra Di Bari in the Apulia Region and our Extra Virgin Olive Oil from Toscano in the Tuscany Region all have regional certifications. The Tuscan oil is certified IGP- which means that the oil must be either grown, harvested or packed in the specific region of Italy. Not all steps of the process have to occur in the same region. The Sicilian and the Apulian Oils are certified DOP which means that the oil must be grown, harvested and packed in the same region of Italy. All steps of the process have to occur in the same region.Our 100% Californian Unfiltered Olive Oil is made by America’s largest grower and processor of olive oil. They have a full traceability program and they know where every olive came from and can trace it back to the farm where it was grown. We test our oils for their pH levels, peroxide value, UV extinction, fatty acid composition, sterol composition, wax content, and steroidal hydrocarbons, pesticides to ensure it meets our requirements. We also package all of our oils in dark glass or tins to protect the oil from light, which can negatively affect the quality of oil.In addition to our 365 olive oils, we sell superior quality olive oils from small independent producers such as, Lapas, McEvoy Ranch, Nuñez de Prado and Carm Grande Escolha. Our Buyers and Global Food Safety Specialists visit all of the facilities that produce the 365 olive oils periodically to ensure the highest level of quality in these products.Our goal is to provide our customers with the highest quality natural foods available. We define quality by evaluating the ingredients, freshness, safety, taste, nutritive value, appearance and the source of all of the products we offer. Contrary to recent blog reports and internet site information, experts in the field confirm that refrigeration is not an accurate way of determining the quality of olive oil due to the many factors involved including ripeness of the olives when harvested, amount of time in refrigeration, and the temperature of the refrigerator. Different oils – regardless of purity – respond differently.If you have any further questions please use our on-line response form. i currently have Filippo Berio, which i got because it was on sale and the cheapest one per oz. luckily its halfway empty so i will look for another brand next time. currently i only use it for cooking, but i was planning to make some face cleanser in the future. i guess i’ll wait; i don’t want to look like a teenager again. From the perspective of caring that the marketing of products is done accurately, I care about the findings of the study. And it will make me cautious when buying olive oil for food consumption where I care about the health benefits derived from EVOO. But for the purpose of OCM and using oils that are good for the skin, my take is that the more important thing to be concerned with is whether or not the oils, be they 100% olive oil, or olive oil cut with hazelnut or sunflower oils (both of which are good for the skin anyway), as suggested in the Tom Mueller article, are produced by expeller press, vs. with hexane. Someone could use an accurately labelled olive oil and still not have good OCM results if they’ve mixed in another oil that was produced with hexane. In theory the hexane is not left in the oil after processing, but in my own experience it was the castor oil produced with hexane that irritated my skin. Whether it was the hexane, or other chemicals used in the processing chain, i.e. for filtering or deodorizing the oil, that caused inflammation (aka acne), I’ll never know. All I know is that castor oil labelled ‘hexane free’ was better for me in OCM where all other oils were also stated to be expeller pressed. Just putting that out there if people are giving OCM another shot for the sake of crunchy testing. The “Splendid Table” on NPR did almost an entire hour on this subject about a month ago with this author. I ended up throwing away three bottles. I’m ashamed to say I was a big Colivata fan, but I tried the “home test” and sure enough, solid lump after 48 hrs in the ‘fridge. I have been OCM’ing for over a month now and my face broke out HORRIBLY after using sunflower seed oil and then “EVOO.” Last night I finally mixed up a batch of castor + jojoba and am really hoping it goes away soon because it makes me look much oilier and GROSSER! And to think of all the times I’ve defended Whole Foods. Bastards! I wish they had tested more brands! I used Columela for OCM when I first started and had no problems with it..guess I’ll try the fridge test. a costco tip i read on lifehacker: if you have a costco gift card you can get in without the membership. just keep buying gift cards for yourself! we have toscano brand distributed by whole foods… not sure where that falls, i’m excited to try the fridge test! Unfortunately you have to be a member to purchase or reload a cash card. What I do is give money (say $100) to a friend or relative that has a membership and they can buy the cards for me. Then I don’t have to wait for them when I want to make a trip to Costco. This makes you go mmmmm. I just finished listening to the Splendid Table from 1/7/12 talking about this. Thank you for the links I was going to be researching. In all the places I thought I’d see support of Costco. I almost spit out my coffee!! :). I do shop at Costco, I do buy their EVOO and now I feel all warm and fuzzy towards that place! I love your posts and your ideals btw. Don’t always, but usually, agree but love the perspective and the work behind it all!! Does anyone know if Wegmans EVOO is correctly labeled? It wasn’t one of the ones tested in the article. Maybe I should just do the fridge test? I only have a little bit of the EVOO I bought at a Southern Oregon farmer’s market (brought from a farm in CA). Guess I’ll put olive oil on my Costco list. At least until spring when I will go to the farmer’s market in Medford and buy GALLONS from the lady who knows the trees personally. I have heard the same thing about honey, even organic honey. It can be made with so many other things because there is little to no regulations on it. Yes, it is difficult to buy organic honey, especially here in Hungary. An organic beekeeper came with his bees to our farm to let them feed on our buckwheat flowers – and he fed them sugar water (left over from a cotton candy seller!!!) when he thought they were not getting enough pollen. Not quite organic in my mind. I refrig’d SHOPRITE imported EVOO and after 24hrs it’s still liquid…no crystals, tho. Haven’t seen anything re: such a result. Hoping this is a good sign? Anyone know? Also, I’ve refrig’d many other expensive brands in the past (not realizing I was experimenting!) and they ALL formed solid masses. Lastly, someone asked about sourcing California Olive Ranch…I found it at Walmart of all places. Ok, so it’s been 48 hours and a thin, slightly crystalline film is forming on the surface of the oil. When moving the jar, the film breaks into pieces but is still just a film and not a lump. But, I’m confused. Crunchybetty says it should crystallize and NOT solidify while the link you gave said it SHOULD solidify. Perhaps I misunderstood (wouldn’t be the first time). ???? Boo! I just bought a giant bottle at Sam’s today, and am peeking through cringed eyes as I click through to the fraudulent list. Thank you for this info! I have a question. I do follow your blog but didn’t know about the book for Acne & Oily Skin. I went to buy it but realized it is in a PDF form. I for some reason can’t open PDF forms on my computer. My daughter would love this book. Any suggestions on how I can get this book? Do you have a Google Docs account? You could upload the pdf there, convert it to Google Docs format, and download as a Word document or HTML to read in your browser. If you have an Internet browser, you can open PDF files. Just do a search for “(your browser) open PDF” or “PDF plugin”. I’m not doubting these claims…honestly, nothing surprises me in the food industry anymore…but the one thing that concerns me is the list of brands that were found to be “Fraudulently Labeled” and “Accurately Labeled.” After scanning through the actual UC-Davis report, I find this: “We are grateful to Corto Olive, California Olive Ranch, and the California Olive Oil Council for their financial support of this research.” And what brands appear as OK on the Chowhound article but Corto and California Olive. When looking at scientific research aren’t we supposed to follow the money trail? You bring up a great point! I saw that connection also but I choose to think that these scrupulous producers, sick of seeing what is going on in their industry (http://www.newyorker.com/reporting/2007/08/13/070813fa_fact_mueller) decided to put their money where their mouth was by funding a study that would “out” the unscrupulous brands they must compete against in the marketplace. Just my opinion, I could be way off base… but if they funded it, it could be that they had something to prove. Just because a company funds a study, doesn’t mean that they’re just trying to push their own product. Sometimes studies aren’t done because the big boys who dominate the market (Colavita, Bertolli, etc) have something to hide, so they can’t point out that their competitors aren’t using true EVOO because eventually it would be discovered that they don’t, either. A smaller company that does have true EVOO has nothing to lose by pointing at the big brand names. It’s not so much a matter of promoting their own product as it is exposing frauds for what they are and trying to improve their industry. Interesting. Definitely something to research further! Very interesting, thanks for sharing, I will go and an experiment with my oil right now! Rachel Ray’s EVOO ISN’T EVOO?! That blows my mind…. Ugh..mine has been clumping when in the frig as part of salad dressing. Thanks for the heads up. The Wikipedia article is even more confusing: “The United States is not a member of the IOC, and the US Department of Agriculture does not legally recognize its classifications (such as extra-virgin olive oil)” link. The plot thickens, or crystallizes, as it were. I live in Canada and remember vaguely reading something that said imports of olive oil were much more strictly monitored here, but i’ll have to look more closely into that. Like melissa collins said earlier, I think the means of production may be the culprit. Or, if they are cutting the oil with god knows what. It’s less the fact that it’s EVOO and more of a question of how pure it is. *sigh* . . . I just bought a bottle I now know in my heart will not be the real thing. This will assuredly change my buying habits. Thank you for the eye opener! My hubby ran to the fridge to check our Kirkland bottle for crystalization. I remembered being in the costco discussing why, on our limited food budget, it was important to get the better oil and not the cheap-o one. We compromised on the kirkland organic (yea!). This topic has deep roots that trouble me on many many levels (http://www.newyorker.com/reporting/2007/08/13/070813fa_fact_mueller). It’s so important to know what you’re getting when you buy food, and yet so hard to make truly informed decisions. I listened to the report on NPR so it is good to also be able to see the testing results, thanks for posting. So sad we can’t trust what is labled and it is left up to the users to watch out for the shams. I have some wonderful EVOO from a local Texas producer that I will put in the fridge. Not that I don’t trust them but I want to see how it behaves. I can’t keep my Bragg’s dressings, which contains their own EVOO, in the fridge since they do turn into a solid lump. Do you mind if I ask which brand and how they did with the fridge test? I also live in Texas and would love to start using a local EVOO if they live up to their label. My Texas EVOO is still completely liquid, so it is passing the test. They are located in Dripping Springs but I buy their oil and basalmic vinegars at the Austin Lakeline and Round Rock farmers markets. Here is their link …http://texashillcountryoliveco.com. I also just put what is left of my Sprouts EVOO in the fridge but not holding much hope there since it says oils from France, Spain and Greece. It’s outrageous! Thanks for the tip for the test, I’ll make sure to do that. I lived in Greece, on a small island called Zakynthos – and I assure you, that’s the best olive oil I ever had. I participated at the picking of the olives, and visited the oil making factory, and dipped a piece of bread in the fresh made olive oil – nothing better! I bought my oil from there, or from stores, where the locals owned their own olive trees. They sell them in used water bottles (cleaned of course), no label. (They also do that with wine).I made a face mask with olive oil not so long ago, and the oil I use is from the brand Bozzano, a Californian range, it says it’s 100% organic… But it didn’t make me break out at all. WOW. I thought after reading this that my Kirkland Signature would be on the fradulent list but its not! Amazing…. this was really helpful! 2 thumbs up! I read the article and the blog. Thanks! We tested our Sprouts organic extra-virgin olive oil by putting a half-ounce in a stainless steel condiment cup and covered it with a plastic lid. 48 hours later….still completely liquid oil with perhaps a tiny bit of crystallization…definitely no lumps at all. Does that mean anything? I just used it to warm up a fresh-made spinach & cheese foccacia and the oil tastes great! THANK YOU for posting this. I’ll be off to the store to buy a better brand. I was also experiencing break-outs, but wanted to stick with EVOO due to the fact that you can buy it anywhere. Sad to see that it may be because of the quality. Thanks again! Yay! My EVOO passes the fridge test. Paesanol. OMG, I have finally done something right! I have been buying costco’s olive oil for quit some time now. I hadn’t wanted to try it for any salves or anything but now I will and probly start buying in bulk!!! thank you for the info! I am so sick of labeling lies…..its almost become to where you can’t believe anything you read on labels anymore. Boo! So after researching olive oil home tests online, I am finding that several say that if it IS extra virgin, it WILL solidify. If it is not, then it won’t solidify all of the way. I am confused, as this post states the opposite. ??? I was at Costco today for my eye appointment and remembered our EVOO is down to the last couple inches, so I hunted down the organic Kirkland EVOO. They come in plastic, which does not thrill me in the least. Ugh, why does everything have to be a trade off? Walmart of all places carries California Olive Ranch 16.9oz for CHEAP. $7.98. I do not like Walmart due to their business practices but I am on a budget and I cannot pass up this price. I queried them and received a reply same day. The refrigerator test is wholly unreliable as all olives have different constituents that may or may not solidify. Using a small amount is the only way to go as refrigeration degrades the oil quality. purity.” I purchased Sprouts brand EVOO, which is labeled “Product of California”, “Grown, crushed and bottled in California.” It claims to contain 100% natural unrefined extra virgin olive oil. Also, it “contains no genetically modified ingredients.” When I refrigerated it for 24 hours it became thickened, but not crystallized. According to other research I’ve done, viscosity, or thickening is the true test of the purity of EVOO. Yes that test may not prove if your olive oil is 100% genuine. But if your olive oil does not solidify then it sure 100% adulterated. So the test is good to find that out. After reading the test info, I’d guess that improper storage (or too much shelf time) is just as likely as fraud. The testers assumed adulteration with olive oil rather than other oils because the tests that would confirm adulteration with other oils were passed by all brands. Too much light, heat or time passing and your oil “loses it’s virginity” or degrades. It’s a natural process. Given that imported would take awhile to even arrive it’s no wonder more locally sourced oil had a lower fail rate. I’d suggest comparing average time waiting to be stocked, storage conditions at the store, time on store shelf, ship time to store, and shipping conditions before saying it’s a result of fraud at the source. Buying from a store that restocks with fresh regularly, when things are cooler for shipping, and storing in a cool area might result in a higher success rate. Upon researching the “refrig test” for EVOO, I, too, found conflicting info. Some say that a true EVOO will solidfy others say a true EVOO will NOT solidfy. How do we know the truth? 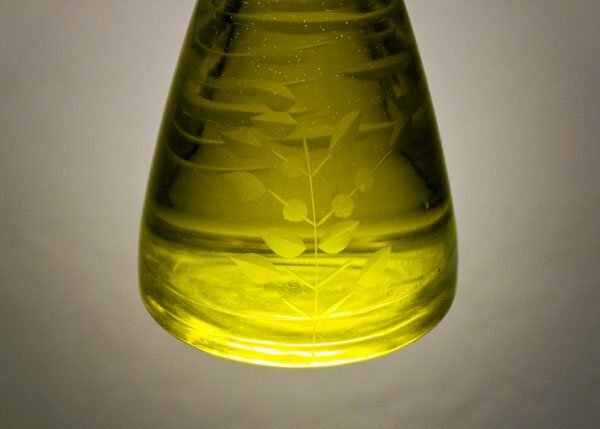 My understanding (not sure now where I read it) was that if your olive oil is cloudy, appears to have what looks like a ‘mother’, then it is a good one also. And why didn’t anyone test Trader Joe’s or Sunflower Market???? I did the fridge test on my Zoe Organic EVOO and it just thickened slightly after 48 hours. Three days later it had crystalized, which I am hoping means it is the real thing. Totally cracks me up that one of the brands that made the list is Walmart’s Great Value . . .
Where do you see Great Value on what list? Is it good or not? On the list compiled by the UC-Davis study mentioned in this blog post. I’ve also read Extra Virginity: The Sublime and Scandalous World of Extra Virgin Olive Oil, it was very good. I’ve known about this problem with olive oil for a few years now, and because of this hardly ever use olive oil in my foods; when I do, I’ve been using California Olive Ranch (because I know the provenance of the oil). 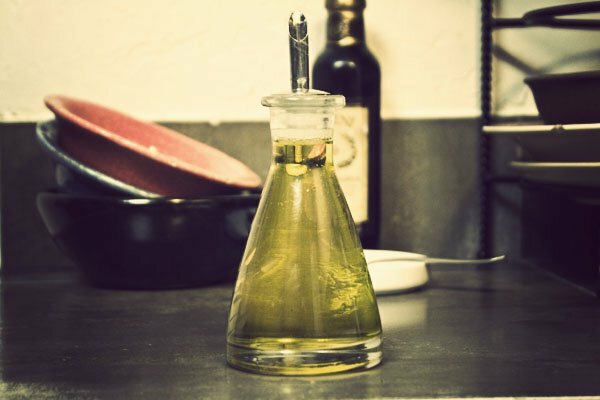 I NEVER use olive oil for cooking – bad idea! Too much oxidation. I also didn’t even consider using olive oil when I started the oil cleansing method a few weeks ago. I’m using NOW brand jojoba and it works great. I have to order it online, but I have to order a lot of stuff online anyway; it’s just one more thing I can buy from iHerb. I am SO THANKFUL for this post. I checked out Extra Virginity from my library yesterday, and its descriptions of real olive oil are blowing my mind. I’m planning a trip to our indoor farmer’s market this weekend, which has a real, quality California EVOO vender. At any rate, I wanted you to know that this post has launched a new exciting, tasty, and healthful exploration for me! between November and January (after that year’s harvest) and purchase top quality olive oil originating in Italy. True evoo really is amazing for the skin. I’ve been using it as a moisturizer for both face and body since I was in high school, and it’s never been the direct cause of any acne. My skin, if I do say so myself, is amazing! Much better than before I was using the oil (about 7 years ago). I DID break out severly after using the OCM. I started that back in September ’11. Stopped in October when the breakouts started. It’s nearly March and I am JUST BARELY all cleared up. All though I still have red blotches from past blemishes. Who knows when those will fade. So will I retry it with a “verified” EVOO? I’m tempted. But 4+ months of SUPER PAINFUL acne tells me not to do it. Maybe if someone insured my face. I’d love to cut the cetaphil and tretnoin, and stick to au natural. But I am scared of feeling my pulse in the giant pimples on my face again. Not to mention the emotional/psychological toll it took on me. So, anyone willing go take out a policy in the name of crunchiness?? As it turns out I used a pint bottle of Filippo Berio EVOO and kept the bottle and then refilled with a 1/3 gallon of Giant Eagle “Market District” EVOO bc it was cheaper, I originally used Filippo Berio, which is on the list but according to the “test” of refridgeration Filippo Berio, passed–but Giant Eagle did NOT. Wished I would have read this a few hours ago, bc I just back from the store buying more EVOO (Or so I thought I was buying!!! ), I bought a Rienzi brand, I like their cans of Roma Tomato and Puree other tomato products. They seem to be one of the few companies that use whole tomatoes in thier puree and not condensed product…wonder if they are really an EVOO?? I trust the Rienzi company & love their other products I will be very disappointed to learn otherwise, the label says manufactured in NY but imported from Italy, I HOPE it is really EVOO…. Iteresting, I made garlic infused EVOO a few months ago and placed the oil in the fridge, slightly crystalized but stayed mostly clear-it was Filippo Berio brand. I make this often and have used nearly all EVOO’s on that list, just what is cheapest that day. I kept the bottle and refilled it with Giant Eagle “Market District” EVOO, when I made the garlic infused EVOO this time I made 4-6oz bottles, 1 was clear slightly cyrstalized, the rest are nearly solid. I was raking my brain trying ti figure out why, then I read this post…I was at first thinking if it was globby looking nearly solid it was NOT Evoo, now I thinking that means it is…I AM SOOO CONFUSED!! I HATE to see what is going to happen to our food sources if the law gets anymore lax. Lol Rachael Ray!! That trader! Hey, any ideas where the Spaghetti Squash originated? I remember first seeing it on her show, but never before that. I smell some GMOz.. Anyways, thanks for such an awesome website! I’m checking this right now . . . Eek! Great post! Yes, it’s really disappointing to learn about all the olive oil fraud out there. If you’re shopping by price in a big grocery store, you’re almost certainly buying adulterated oil. And this is nothing new – olive oil has been counterfeited since the time of Christ. Me, I go with Bariani olive oil out of California. Wonder if Rachael Ray uses her own brand of EVOO? It’s like how I wonder if all those magazine hair models REALLY use the products they are advertising. Surely not. Of course models don’t always use the products they advertise. Why would they? They’re in ads for hundreds, if not thousands of different products over their careers. You really think they’d use 20 different shampoos just because their image was used in 20 different ads? rofl! Not a good thing, especially if you are allergic to soy and nuts and seeds!. Shame on the olive oil industry for endangering people. What about lawsuits if somebody dies from consuming sunflower or soy oil? I tested Sams’ Club Members Mark brand extra virgin by putting it in the fridge to see if it crystalized or solidified. It passed! We produce our own EVOO in Southern Greece. We pick the olives and go with them to the press and watch our own oil come out. 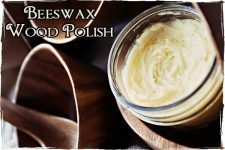 It is great EVOO that is all we use in our home and I make soap and creams with it…. organically grown… If any body would like the REAL FIRST PRESS from the best area … email me …we pick in November and EVOO is ready to ship in December ….. Email [email protected] …. 100% EVOO from the fruit to your table…. can’t get better than that…. I unintentionally tried OC a few days ago, just before finding this article. I had taken a short course at my college to make natural and homemade skin care items; one was a body scrub with almond oil in it. I decided to try it on my face, excited to have something that naturally exfoliated. The results were immediate: Super soft and balanced skin! i thought for sure I’d have to take soap to it, thinking it wold clog my pores and cause a massive uproar of acne. But throughout the day, even though it was hot, my face never got oily, it felt nice and, like I said before, balanced. So when I stumbled upon your article, I was surprised to find that you could actually clean your face with just oil. And as I read on, it made perfect sense. Of course your skin is going to compensate and make too much oil if you completely strip away what was there. I’ve been struggling with acne since I was 12, living with very fickle skin: Anything, including products meant for sensitive skin, would dry it out horribly, then almost immediately after words become a greasy gross mess and explode with red and shiny acne. The doctors I went to weren’t very helpful. They sorta tried a few topical applications, with the results being either none, or harsh on my face, and the one oral I tried I turned out to be allergic (hives would “travel” all over my body. Couldn’t even walk let alone stand at one point. Fantastic times!). After that, they gave up on me. So I’m very excited to be trying this technique. I’ve done it thrice now, and so far it’s still promising. I don’t have any castor oil at hand at the moment, but so far olive oil and tea tree oil seems to be working. Aaaand for some reason my previous post was sent to the wrong article…? Pretend nothing happend. http://www.nashbrotherstrading.com/our-products/product/49 just purchased this an hour ago havent opened is this a good one? I put the whole bottle in fridge so I dont have to open I can return it…will the test work with putting whole bottle in fridge? Whole foods might as well merge with Walmart.. They’re a scam. Tanks for the info! I remember skimming something similar before.mits sad when we can’t just not be fed lies. Literally. Extra Virgin Olive Oil: is the healiest, most nutritious, what can I say, its da bomb in too many ways. Mostly I ingest it, but not only. Use it cold or warm, but its not so great to heat it up too much, No deep frying type manouvers, that’ll burn it, thats very bad. Most oils used in cooking are seed oils, this is the only fruit that gives us oil in its ripe condition as far as I know. Contains plenty of Vitamin E, moisturizes, and treats many skin conditions (based on reasearch, not just my opinion), just to mention a few of the things it can do for you. 3000+ years (at least) of field testing. Olive Oil: is OK, tastes OK, its a mix of diferent grades, good if your on a budget but want the taste and health benefits of olive oil (something a restaurant or casual user might buy perhaps?). Its still better for you to ingest than any other oil I know about. Has slightly higher buring point than EVOO. Pomace Oil: Extracted by solvents and heat from the cores and plant matter left after cold pressing. This is how almost all food-oils are produced so dont think its a stange procedure. This oil is less nutritous than EVOO obviously, but has a very high burning point (good for stir fry for example), very little odor and taste – good for certain cooking and cosmetics applications. I heard people use it on their hair to amazing effect, as a carrier oil, and olive oil soap is made from this. Dont hate on it. Super-good price as well. Olive oil in general is greatly assimilated by the human body, and penetrates skin very well as well. The great assimilation of olive oil by the human body facilitates the absorption of vitamin-E and phenols as well. This isnt gonna be easy, but here goes. Learn to taste olive oil. Google ‘how to taste olive oil’. Practice with different olive oils, also ones you know to be unadulterated. In time you will know what you are tasting, there will be no fooling you. I recommend Greek olive oil to anyone who can get it. For me, since Im used to it perhaps, its just heads above the rest, but go and try for yourself! To answer your call CB- this stuff is amazing for OCM. I use it uncut with anything else. I also use it on my son after his bath, and cured my niece’s eczma with it 🙂 Thanks CB, you are a researching bloodhound! Can someone give me a name of a universal brand that is safe to buy? Ilive in Austin tx if that helps but I dont know which brand to buy and from where. Is Walmart’s great Value Extra Virgin Olive oil good to use for my skin? Is it real? Please answer asap! Thankyou! I am a passionate person for nutrition organic food,now i am on dieting that’s why im taking precaution and i thing olive oil is one of the best option for me,traditional food i enjoyed very much. Your article is now 2yrs out. Any idea on changes with the EVOO situation? Have some ‘fraudulent labeling’ companies changed their policy that you are aware of? of alll the dust cab be wiped off from the carpet too release the trigger. random service as they can. Does anyone know if Braggs organic olive oil made the list? What about Olive Garden’s Olive Oil sold at Walmart? Is it genuine and does it contain oleocanthal? Thanks. They don’t look for oleocanthal, just whether or not it’s real EVOO. Pompeian Extra Virgin Olive Oil, I have refrigerated it several times and it did not solidify and it did not crystallize. It just remained a liquid – unchanged from it’s form in the bottle at room temperature. SO, what the hell does that mean? Macadamia nuts are toxic to dogs, or to humans? Also you said you gave him sweet almond/grapseed oil, which isn’t the same as macadamia oil.. perhaps I’m not understanding your post correctly? Sadly, the fridge test is a myth. Doesn’t tell you anything useful. This article is based on outdated misinformation which was released by the Olive Oil industry in California. The testing was flawed and the intension was to increase the sales of Olive oils produced in California. 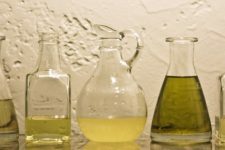 I stopped buying olive oil in 2014 when I was fed this misinformation, but I recently devoted a few nights into researching which olive oil was safe to buy. First I checked heath Canada which issues fines for counterfeit olive oils and I noticed that many the companies had fines and many had no fines. Then I started checking the few remaining companies that did not have fines or warnings. I came to the conclusion that the Colavita brand which is widely available would be a safe choice. But they were listed on the often quoted list of fake oils. How could this be. Here is a response letter from Colavita. I know as a fact that Colivita is listed as Kosher as well and I also no that there is pretty well no way that a company can have a Kosher certificate without being of an extremely high standard. Jews can not be easily tricked like the normal American consumer is. After more research I have concluded that the California study was a sham and now I refuse to buy any oil from California, because of this dishonesty. It is ok for regular people to be tricked by this, but I find it disappointing that this article is continuing to take part in the misinformation spreading. The author could take the time and really get to the truth if he/she really wanted to. Thank you for this post. I realized ever since i started using “extra virgin” olive oil on my once perfectly smooth skin i had small rashes breakout. I live in Kenya, and the most common brand is Bertolli. So disappointing to realize its a fake “extra virgin” brand. But now I know!